KIEV, Ukraine -- A new Russian-led offensive in Ukraine is likely to take place within the month, the former head of US and NATO forces in Europe warned. A Russia-backed rebel sniper wears a mask in Debaltseve, Ukraine. Retired General Wesley Clark warned at an exclusive briefing with the Atlantic Council that a renewed Russian offensive in Ukraine was "imminent" and would "most probably" take place between Orthodox Easter on April 12 and Russia's celebrations of VE Day on May 8. Clark said he reached this timeframe by speaking to a number of sources within the Ukrainian military both in Kiev and along the frontline in eastern Ukraine. "Ukrainian forces expect attack within the next sixty days," Clark writes for the Atlantic Council. "This assessment is based on geographic imperatives, the ongoing pattern of Russian activity, and an analysis of Russian actions, statements, and Putin’s psychology to date." Clark further noted that Russian and separatist forces are already massed both in eastern Ukraine and along the Russian border. "Some nine thousand Russian Federation personnel and thirty to thirty-five thousand separatist fighters are in eastern Ukraine. These forces include some four hundred tanks and seven hundred pieces of artillery, including rocket launchers," Clark estimates. "Another approximately fifty thousand Russian military personnel are located along or near Russia’s border with Ukraine. A further fifty thousand Russian personnel are located in Crimea." The ultimate goal of the assault would be the creation of a "land bridge" linking Russian-annexed Crimea to the separatist controlled zones of eastern Ukraine and ultimately to Russia. Any push to create a land bridge would focus on taking the Ukrainian port city of Mariupol, a strategic port and steel-producing city on the Sea of Azov. In January, a separatist leader took responsibility for rocket attacks on the city that left 20 people dead. 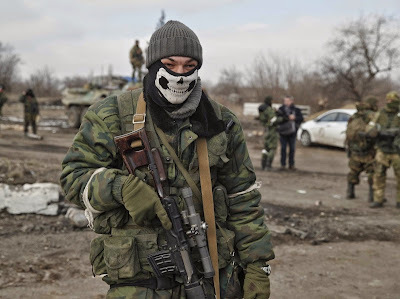 In a candid interview with BBC Russian, translated by Vice, a Russian fighting in eastern Ukraine admitted that the separatists had been preparing for an assault on Mariupol in the beginning of March, despite the signing of a ceasefire in February. Reuters reported at the end of February that, despite the ceasefire, Russia continued to move tanks, missile systems, and busloads of troops to the separatist-controlled city of Novoazovsk approximately 25 miles east of Mariupol. Ukraine's military spokesman told Reuters that the city could serve as a launching pad for an invasion of Mariupol and then ultimately a continuation of the offensive all the way to Crimea. If the attack on Mariupol were to take place, Clark warned that the ramifications of the assault would be felt far beyond Ukraine. Ultimately, Clark believes that Putin's actions and goals are aimed at destroying the current system in place in Europe as a whole. "[Putin’s] objective in this would be much broader than Ukraine. It would be to shatter the sense of well-being and confidence among the nations of Eastern Europe in NATO protection and, ideally, to drive a permanent wedge between the United States and its European allies, and the Western allies and Eastern Europe,” Clark said.